It was opening day at The Remarkables and I was pumped! It was a Thursday and the coverage was great for start of the season. Mick was working so I was riding solo - cruising about, getting reacquainted with the terrain, getting my body back into the groove of snowboarding and feeling pretty damn good about it. That was until I got taken out by a snowboarder not once but twice. Both incidents happened on uncrowded runs and after the second one, I was so annoyed, I decided to call it quits for the day. YEP, THAT’S ME BEING TAKEN DOWN! Maybe it was ‘first day of the season frenzy’ or genuinely not having a clue but I could have been seriously hurt. It doesn’t take much when you are skiing or snowboarding - all you have to do is fall a bit awkwardly and boom, broken wrist, twisted knee, fractured collarbone. 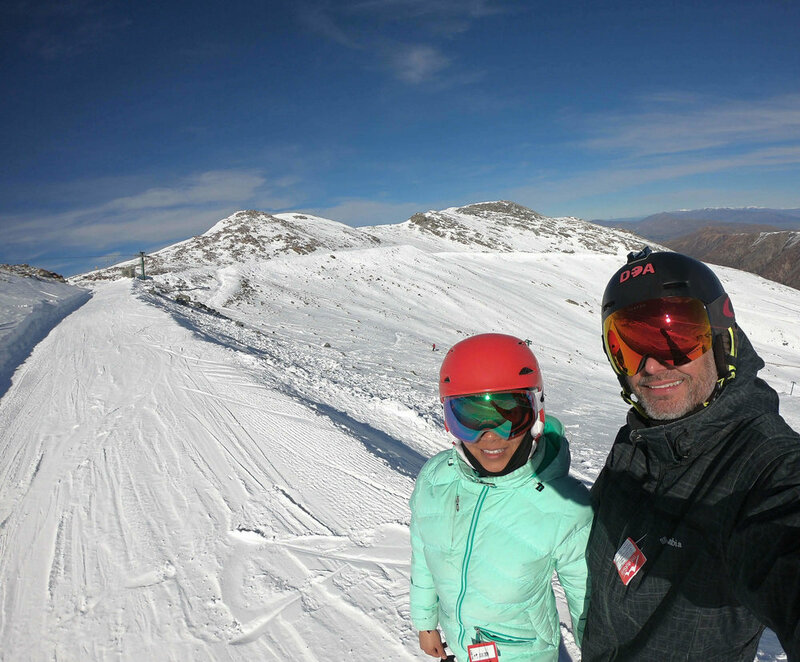 There are universal rules when skiing and snowboarding, applicable to everyone, worldwide. Commonly known as the Alpine Responsibility Code, it is endorsed and used by most ski areas around the world with slight variations. Ultimately, it's about using some common sense and personal awareness to reduce elements of risk. Here’s the Alpine Responsibility Code broken down plus a few little extras from me. I’m all for progression and building confidence but be careful not to overestimate your ability. If you’re a beginner, that’s ok, we all know that gaining control and learning to stop takes time. We expect to see out of control skiers and snowboarders on the green learner runs. That’s what the learner runs are there for. Just don’t try to be a hero and jump up to a double black diamond without first feeling confident on an easier run. This means EVERYONE in front of you. It doesn’t matter if they are skiing or snowboarding the weirdest line ever and blocking your path, they still have right of way. You can see people in front of you, but that person can’t see you behind them. Sure, you can go ahead and pass them, but it’s not like driving a car where it is fairly easy to anticipate what the car in front of you is about to do. On the mountain, there are no lanes or set paths so predicting where the person in front of you is about to go isn’t always that easy. Over time, you do learn to read a persons riding style and can better anticipate movements but ALWAYS be prepared for the unexpected. This rule is for your safety, the safety of others and for the enjoyment of everyone. There’s nothing worse than having to pull a stop because someone has obstructed your path - even worse when you are on a flat cat track and lose your momentum. But don’t I have the right of way you say? Technically yes, but you’ve also stopped in a blind spot, so stack the odds in your favour and stay visible. Don’t stop anywhere where there is a chance that a skier or snowboarder will not be able to stop, avoid you or land on you. Aside from the fact that you are doing the right thing, ski patrol needs to investigate the incident, the risk of occurrence and take appropriate safety measures. Some ski resorts require leashes on snowboards but most ski resorts are pretty relaxed with this rule. Skis have ski brakes, so check that your ski brakes are 100%. Be conscious of your equipment and where you are placing it. Make sure snowboards are placed bindings down to the snow and across the mountain (not pointing down). Again these are for your safety. Ending up on a double black ungroomed trail when you’ve just graduated to a blue run could have you in tears, potentially injured or at the very least result in a tantrum. Ski patrol go through a lot of effort on a daily basis, often updating mountain conditions throughout the day. We often take for granted how safe the mountain is at a commercial ski resort but rest assured, those warnings are legit! I’m all for a cheeky beverage here and there, but being intoxicated can lead to bad judgement and reduced coordination. Don’t try to take on the mountain, that magnificent beast will always win. Take your ski poles off your wrists and hold them together. This is so that if they get caught on something, you can let go of them easily, preventing injury. It also prevents your poles from wandering around and poking someone (super annoying when you are at the receiving end of someone else's loosey goosey ski pole). Some people hold them between their legs, to the side of their legs or sit on them. Make sure your skis and snowboards aren’t tangled up with anyone else’s. Realising this at the moment that you are trying to dismount the chairlift doesn’t end well for anyone! Try to distribute weight evenly on the chair. For example, if there is two of you, try to sit with an equal distance from the middle or end of the chair. Particularly with older chairs or windy conditions, it will help when you get off the chairlift. For example, if Mick and I sit together on one side of the chairlift, when Mick gets off the chair, it creates a catapult/seesaw effect - the chair swings and bounces making it a little challenging for me to get off! This one is more courtesy than anything. Some skiers and snowboarders will push off the chairlift aggressively causing the chairlift to rock, swing and get a little unstable. It’s not a huge deal, but like the point above, it can make it challenging for others trying to get off. Put the bar down. Always. I don’t think I need to really explain this. I learnt about this concept when I was learning to ride a motorbike. It’s something that I think everyone should understand because it applies to so many aspects of our daily lives. If you begin to lose control when you’re skiing or snowboarding and are heading towards an object like a tree or person, don’t focus on it/them because you will inevitably collide into that object or person. Instead, look at the gap between the trees or at the gap next to the person you are heading towards. This should steer you towards where you are looking. When I was taken out twice in the one day, I think I was most upset about the fact that neither person took responsibility or seemed to care. There was no apology for crashing into me. A simple sorry would have made my day a whole lot better. I hope that this gives you a better understanding of the universal rules for skiing and snowboarding. 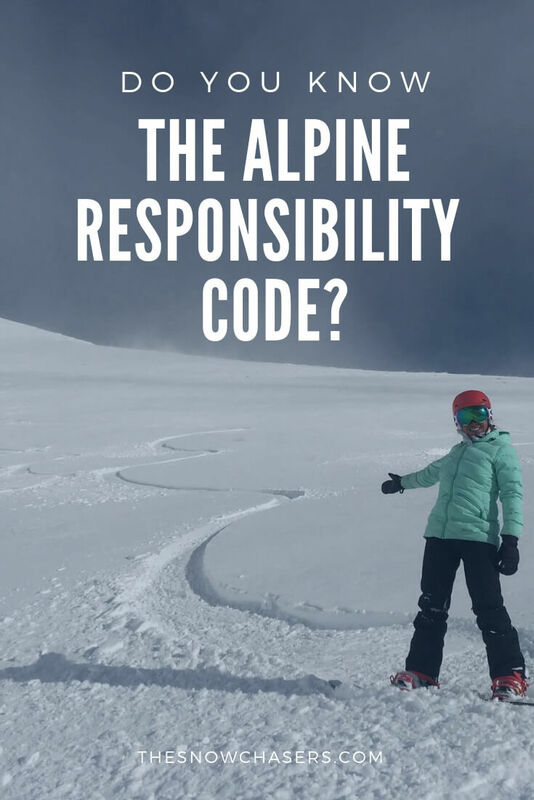 Make yourself familiar with the Alpine Responsibility Code - following these rules for skiing and snowboarding shows respect for others on the mountain. Adhering to these rules will ensure everyone has a safe and fun time on the mountain. Do you have any other tips or guidelines that you think everyone should know about? Let me know in the comments below! Here’s a guide for you on the different types of snow that you’ll find on a mountain. I promise once you read this, you’ll start to notice the differences when you next go skiing or snowboarding.